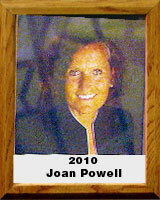 A graduate of Salpointe Catholic High School where she was Player of the Year on the volleyball team, Joan Powell played four years of volleyball at the University of Arizona. The 1972 UA team qualified for the national championships. After graduation, she played USVBA volleyball and was a member of the 1988, 1989, and 1991 national championship teams. Powell was head volleyball coach at Salpointe High (1973), Palmer High in Colorado Springs (1975), and Coronado High in Colorado Springs (1976-2006). Her team won the 1983 3A state championship, the first-ever state title for Coronado High. In 1988, Coronado won the 4A state title and her 1992 team captured the 5A state championship. She was able to assist 30 student-athletes in receiving volleyball scholarships.